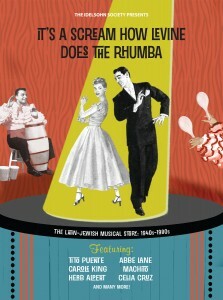 We’re pleased to announce our 2013 release: IT’S A SCREAM HOW LEVINE DOES THE RHUMBA: The Latin-Jewish Musical Story 1940s-1980s. This two-disc set, due out November 26, chronicles the musical confluence between Latinos and Jews in the U.S. Our liner notes feature essays from Los Lobos’ Steve Berlin and Grammy award winning bandleader Arturo O’Farrill. This is the first album of its kind to excavate and mine the cross cultural tale- Jewish artists exploring Latin music styles and Latino artists engaging with Jewish themes, topics and audiences. Featuring legendary artists like Eddie Palmieri, Celia Cruz, Herb Alpert, Carole King, Tito Puente, and many more. Album release Mambo party at the CJM December 5th.